Executive Director Sarah Tsitso with a couple of poitou donkeys. 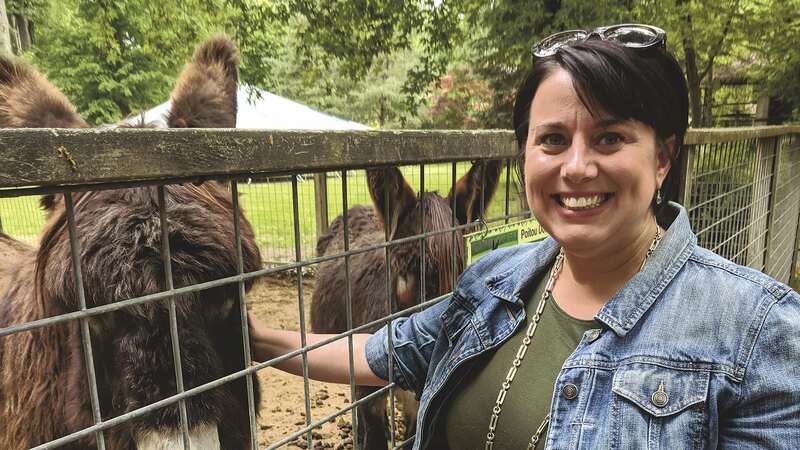 The Zoo in Forest Park & Education Center has seen its share of changes over the decades, and its current executive director, Sarah Tsitso, admits it’s still an underappreciated asset in Springfield. But an asset it is, she asserts, one that has honed its focus in recent years to emphasize education, conservation, and rehabilitation — and all the intriguing ways those ideas intersect. Montana is a bobcat who used to be someone’s pet. That is, until, authorities found out and confiscated her; even out west, you can’t just go bring home a bobcat. But since Montana had been declawed, the aging feline had no chance of survival in the wild, and needed a new home. The Zoo in Forest Park became that home. She’ll share the zoo’s four and a half acres with some 150 animal species, from timberwolf siblings Orion and Aurora to a pair of red-tailed hawks who rehabbed from injury but are not releasable in the wild, to a three-legged baby opossum who had the fourth limb amputated due to a serious injury, and is being moved from a sanctuary to its new home in Forest Park. In fact, the majority of the zoo’s animals are elderly, disabled in some way, or otherwise unable to survive in the wild, which makes the center’s focus on conservation and rehabilitation an important part of its robust educational outreach. 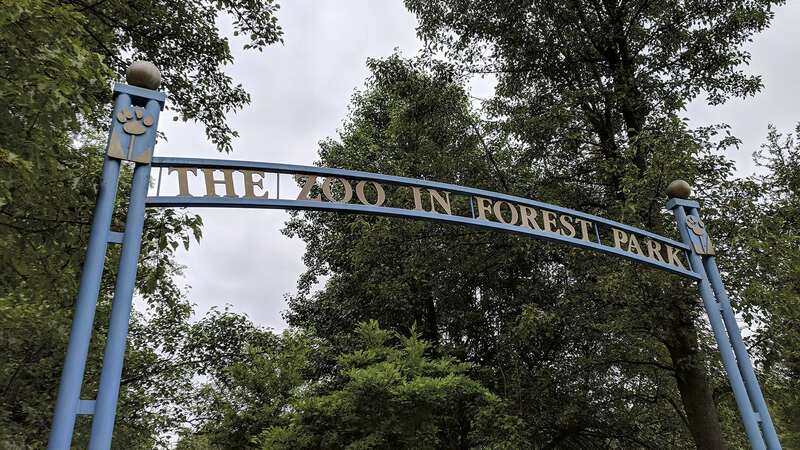 Although a part of Forest Park for well over a century, the zoo is still an underap-preciated city asset, its executive director says. The zoo is currently working to bring in two bald eagles, a male and female, from a wildlife sanctuary in Alaska. Neither is releasable into the wild, as one had to have a wing tip amputated, and other one had a broken wing, so neither can fly. “They’ll provide some interesting education to the public about bald eagles and why they are a symbol of our nation and how they were once endangered and now, through all these conservation efforts, their population has stabilized, which is wonderful,” Tsitso said. In the meantime, this nonprofit veteran has found her own new home in a job she loves. 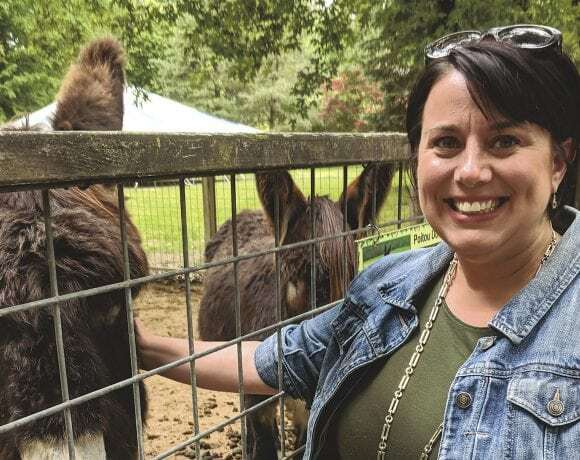 Tsitso told BusinessWest that Nathan Bazinet, the zoo’s interim director before she arrived, and Nunzio Bruno, then its board president, were looking for someone to come in and bring stability to this venerable nonprofit, despite the many challenges it faces. “They wanted someone to connect it to the community and run it like a business,” she said, noting that conversations started a year before she came on board, but when she did, she fully embraced the opportunity. Until recently, Tsitso and her family lived in the Forest Park neighborhood — for more than 15 years, in fact. True to the zoo’s full name — the Zoo in Forest Park & Education Center — the facility focuses heavily on wildlife education, offering a variety of educational programs and special events for children and adults, from Zoo on the Go — which brings animals into schools, libraries, and senior centers — to guided tours and discovery programs for all ages, as well as Zoo Camp during winter and summer school vacations. The zoo also offers a vibrant internship program, she said, providing students at area colleges studying animal science or veterinary care an opportunity to learn outside the classroom. Broadening those programs is a priority, Tsitso said, for reasons that extend beyond the value of education, which is significant. The zoo used to receive state funding, but that ended about five years ago, although Tsitso and her team are trying to re-establish that revenue source. Meanwhile, community partnerships remain crucial, like Paul Picknelly’s recent donation of first-week proceeds at the new Starbucks at Monarch Place to fund an exhibit of African cats at the zoo. 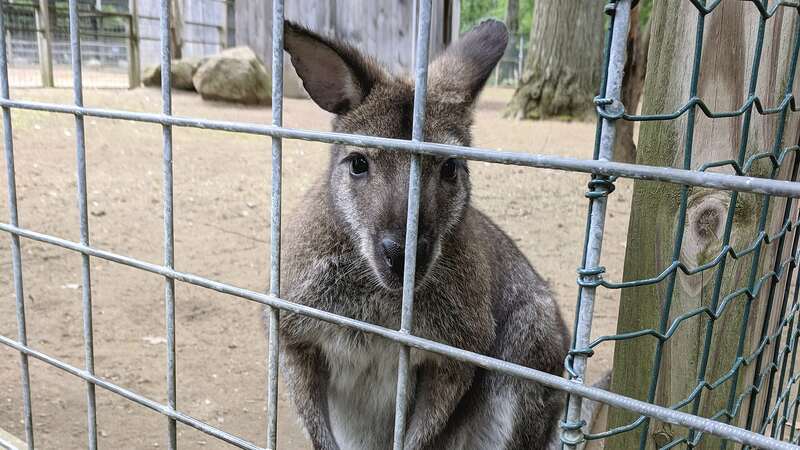 This wallaby is one of some 150 species of animals living at the Zoo in Forest Park. Operating a zoo at affordable admission prices — in addition to day passes, many families take advantage of $85 memberships, which are good all season for up to six family members — is a challenge, Tsitso said, especially since the zoo is not affiliated with the city and gets no revenue from other Forest Park-based events. It does benefit from a series of 25-year leases from the city at $1 per year — the current lease expires in 2035 — as well as the fact that Springfield foots its electric bill. Those directors chose Tsitso — who has claimed leadership roles with nonprofit groups including Greater Springfield Habitat for Humanity, the East of the River 5 Town Chamber of Commerce, two Springfield-based Boys & Girls Clubs, and the Food Bank of Western Massachusetts — to guide the zoo through its next era of growth, but it has to be controlled growth, she said, based on its limited footprint. That’s why she and her team are working with the animal-care staff to create a sort of wish list of what animal exhibits the zoo lacks, what it should bring in, and how it might acquire those animals. In many ways, the Zoo in Forest Park is not the same attraction families experienced decades ago, Tsitso noted. The animals that do call Forest Park home have plenty to offer visitors, including the rush of school groups that take field trips there, averaging some two to three groups a day during the spring. When the zoo shuts its doors to visitors for the cold months, typically around Halloween, the ones who don’t like the cold move into indoor facilities — like Oz, a spotted leopard Tsitso pointed out on a recent stroll with BusinessWest through the grounds. Oz has a large outdoor enclosure, but also a small ‘house’ that’s heated during the cold months. It’s home to him, just as the Springfield area has long been home to Tsitso, who has found her new calling leading the zoo’s small staff — two full-time animal-care professionals, about four part-timers, and a raft of volunteers and interns — into whatever its next phase may bring. “Springfield is very important to me. 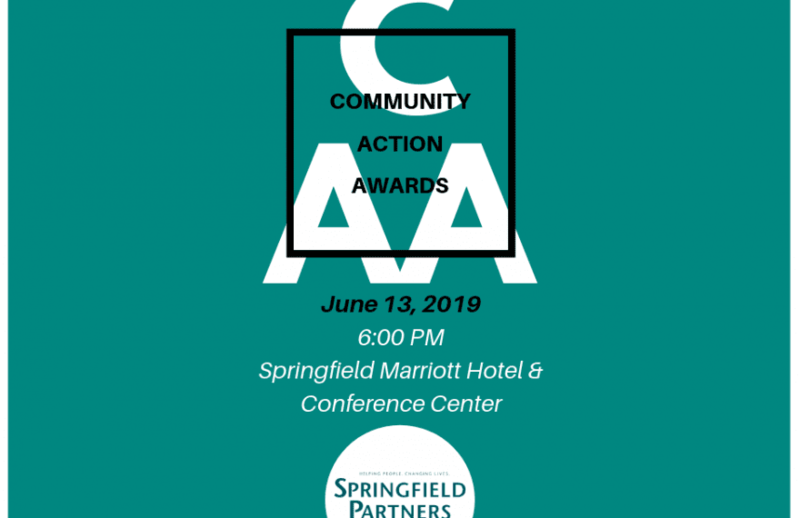 It really is the economic center of our whole area, and when Springfield succeeds, we all succeed,” she said, adding, however, that the zoo is a city asset that feels, well, apart from the city. Not just for her, but for those who visit the zoo — and the growing collection of animals that call it home. Patrick Callahan doesn’t know exactly where the image originated. It was a Facebook post about a community overseas that had set up a refrigerator on the side of a street to provide the homeless with leftovers offered by the local community. “I think it was in India, but I really can’t be sure,” said Callahan, adding quickly that the exact location wasn’t and isn’t really important. What is important is the concept and the proactive, imaginative response to the needs of the homeless. And what’s more important still is the way it inspired him to not only ask what could be done in this region — a thought experiment, as he called it — but to help answer that question. “I thought to myself, we should be doing something like that refrigerator,” said Callahan, a member of the emerging third generation involved with Palmer Paving Corp., who approached the principals there, including his aunt, Jan, about leveraging the company’s many relationships within the communities it serves and building upon its long history of giving back to address obvious needs. That ‘something’ is an emerging and intriguing story called Nicebox, a 501(c)(3) nonprofit created in 2016 to address the many needs of the homeless. One of the original ideas — and it is still being talked about on many levels — was to install solar-powered vending machines in strategic locations that would, in exchange for a certain amount of recyclables, dispense a Nicebox, a pack filled with items the homeless can use. While discussions on machines continued, talk also focused on exactly what should go into these packs, said Pat Callahan, adding that, eventually, it was determined that several different kinds of packs are needed, including those filled with food, hygiene items, and healthcare needs. And the newly created nonprofit set about creating some of these packs, starting with the one that has come to be called the Tidypack. It contains a host of hygiene products, including soap, shampoo, conditioner, a razor and shaving cream, a toothbrush and toothpaste, and more. Working with the Friends of the Homeless, part of Clinical & Support Options (CSO), Nicebox has distributed more than 3,000 of these packs to date, said Pat Callahan, adding that the boxes are catching on, and so is that name, Tidypack, thanks to a true partnership with Friends of the Homeless. The packs can last an individual a week or more, said Jan, adding that the cost of filling one — thanks to wholesale purchases and discounts given to nonprofits — is roughly the same as that for a gourmet coffee, and this is the message Nicebox is spreading as it goes about enlisting support for its efforts. 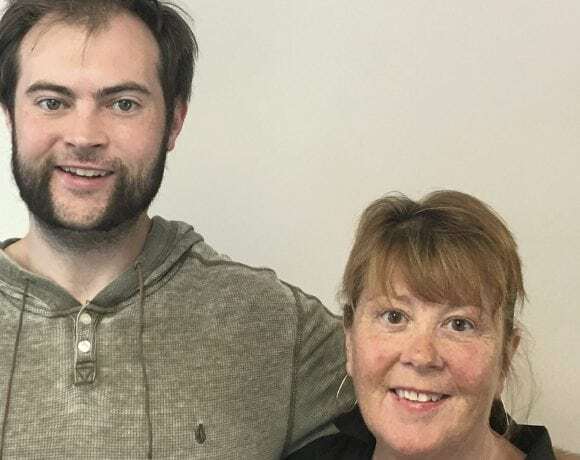 Pat Callahan and his aunt, Jan, say customers and partners of Palmer Paving have supported Nicebox early on, and they want to see that support expand outward. And the nonprofit has secured quite a bit of help, she went on, noting that while Nicebox does some fundraising — she recently conducted an appeal on Facebook — it has thus far mostly relied on the support of customers, vendors, and other partners of Palmer Paving. 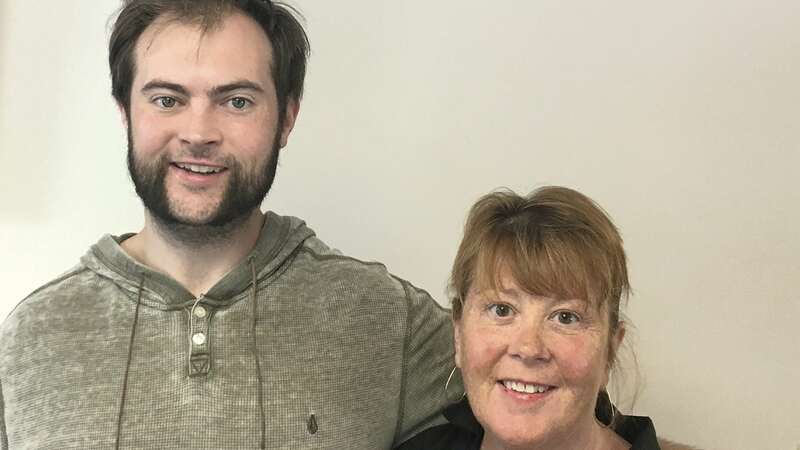 “With the reach that Palmer Paving has, we’ve been sending out sort of ad hoc requests for donations within our group of friends and company friends, and they’ve been supportive of this,” she told BusinessWest. And support is needed as the nonprofit looks to not only expand the presence of the Tidypack, but also move forward with another type of assistance package — the Healthpack. 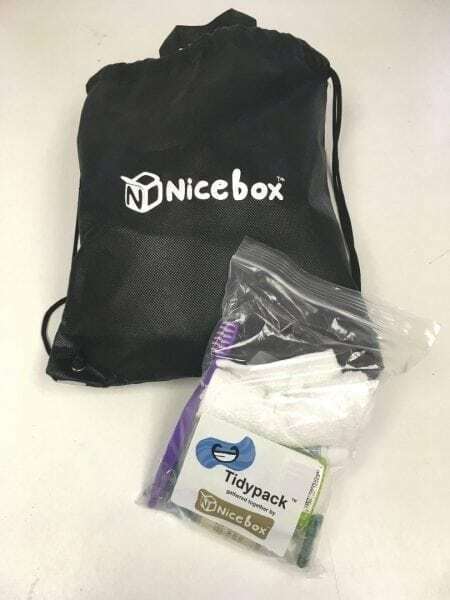 Indeed, Nicebox is collaborating with Mercy Medical Center, which already has a strong track record for work with the homeless in and around Springfield, to introduce the packs this summer. They will include such items as a clean pair of socks, Band-Aids, ointment, a sewing kit, and other items, said Pat Callahan, and will be distributed by the medical center to those who, for whatever reason, will not come to a homeless shelter. Moving forward, Pat and Jan noted that those involved with Nicebox have been working diligently over the past two years to track their progress and results, with the goal of using the accumulated data to apply for grants from foundations and other entities so the nonprofit doesn’t have to rely on donations and can expand its efforts geographically and through initiatives that might include a Nicebox on wheels that can distribute packs to a wider area. Mercy Medical Center is part of the national Trinity Health system, noted Pat Callahan, adding that this affiliation may become a vehicle for taking the Healthpacks regional and perhaps national. Already, the nonprofit has become involved with some initatives in the Hartford area. Meanwhile, Nicebox is also taking steps to increase its visibility through a number of initiatives, including booths at events like the upcoming Springfield Jazz & Roots Festival and others like it. Overall, Nicebox is focused on putting its mission on a rock-solid foundation and continually building — those sound like phrases that would be heard at Palmer Paving — on a concept grounded in meeting need. Like Patrick Callahan said, he’s not sure where that Facebook post of the refrigerator on the side of the road originated from. What matters is that he saw it, he was inspired by it, and he’s working with others to find similarly unique ways to help those who need some.